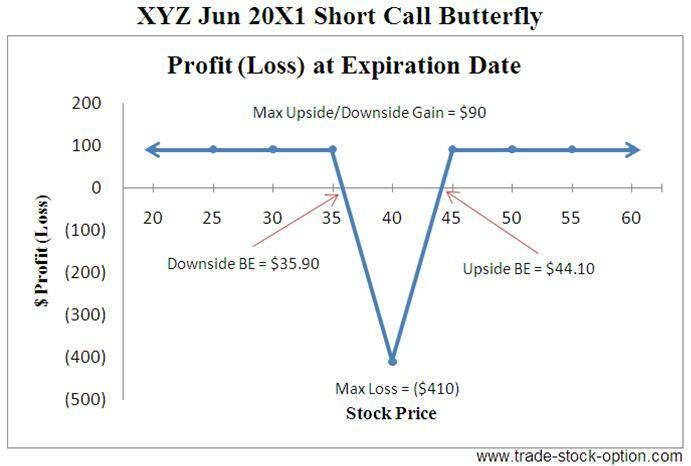 Short Call Butterfly is one of the volatility strategies employed in a highly volatile stock. It usually involves selling one lower strike (In The Money) call, buying two middle strike (At The Money) call and selling one higher strike (Out of The Money) call options of the same expiration date. Typically the distance between each strike prices are equal for this strategy. Long Straddle with net credit received when the trade is entered but with capped rewarded. Outlook: With this stock option trading strategy, your outlook is directional neutral. You are expecting an increase in volatility of the underlying stock moving in either direction. Limited to the different in adjacent strikes less net premium collected. Limited to the Net Premium Collected when the underlying stock trade outside the range of strike prices at expiration date. Downside Breakeven = Lower Strike add Net Premium Collected. This is typically a net credit trade as you are collecting more premium from the call options sold. Collect premium from a volatility trade with no capital outlay. Make profit from extremely volatile stocks, without having to determine the direction. Limited risk exposure when the underlying stock is at the middle strike price on expiration date. Usually offer smaller return compare to straddle or strangle strategies with only slightly lower risk exposure. Significant movement of the stock and options prices is required for this strategy to be profitable. Offset the position by buying back the call options that you sold and selling the options that you have bought in the first place. As the underlying stock fluctuate up and down, advance option traders may choose to unravel the spread leg by leg. In this way, the trader will leave one leg of the spread exposed while he profit from the closure of the other legs. Assumption: XYZ is trading at $40.50 a share on Mar 20X1. The verdict of a legal law suit against the company is expected to be made soon. You are expecting share price of XYZ to soar up or plummet down once the verdict is out. You would like to profit from the volatility of this stock without any capital outlay. In this case, you may consider to sell one Jun 20X1 $35 strike call at $7.50, buy two Jun 20X1 $40 strike call at $4.50 and sell one Jun 20X1 $45 strike call at $2.40 to profit from the volatile outlook of the stock. Note: commissions are NOT taken into account in the calculation. Before you executed a Short Call Butterfly strategy, you must first determine at which price the underlying stock will most probably NOT be trading at the expiration date. This will be strike price (middle) where you will purchase the two options. Next sell a lower strike option and a higher strike option with equal distance from the middle strike purchased. Typically when you short a butterfly, you will receive credit from the trade. This will be your maximum profit at expiration when the underlying stock close below the lower strike or above the higher strike. The maximum loss will occur when the underlying stock close at the middle strike price at expiration day. Time decay is generally harmful to this strategy as you need a lot of movement in the underlying stock for the trade to be profitable. Once it is in a profitable position, time decay will become helpful. You may also execute the Short Butterfly strategy using all puts options. 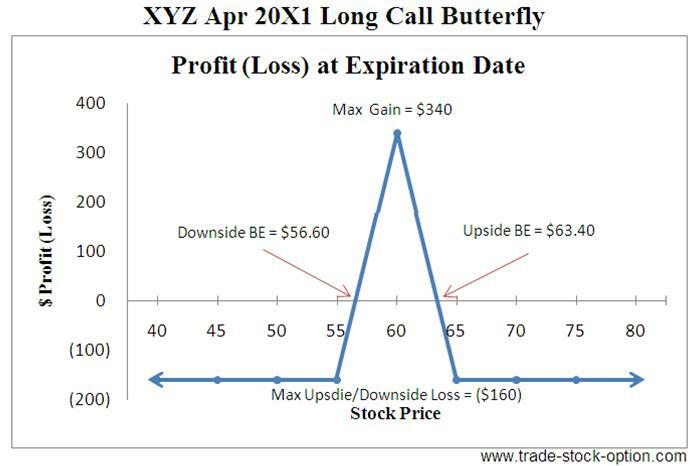 When all puts options are used, it is referred to as the Short Put Butterfly strategy. The characteristic of Short Put Butterfly is the same as a Short Call Butterfly. As to whether a butterfly strategy should be executed using all calls or all puts options depend on the relative price of the option. The premium of both puts and calls option should be taken into consideration to achieve the optimum trade. 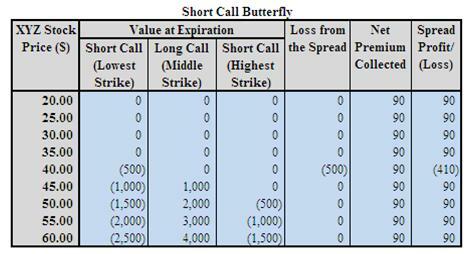 You should pick the strike price and time frame of the Short Call Butterfly according to your risk/reward tolerance and forecast outlook of the underlying stock. Selecting the option trading strategies with appropriate risk-reward parameters is important to your long term success in trading options. Next go to another volatilities strategy, Short Call Condor, to learn how profit can be make from a volatile stock.